Congratulations to Dr Natalie Edwards for being awarded a 2016 Australian Award for University Teaching Citation. Natalie received the Citation for the development of new curriculum built around an e-learning environment which has significantly increased student success and retention in first-year French. 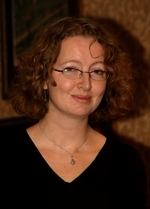 In 2015 Natalie won a Faculty of Arts Teaching Excellence Prize and the Executive Dean’s Prize for Excellence in Teaching for her development of curricula and resources that reflect a command of the field, and for approaches to the support of learning and teaching that influence, motivate and inspire students to learn. She was also one of two recipients of the University of Adelaide’s 2015 Stephen Cole the Elder Award for Excellence in Teaching. Natalie is a Senior Lecturer in the Department of French Studies. This entry was posted in Awards & Achievements, News and tagged French Studies, Humanities. Bookmark the permalink.